I am proud to say that we put in a 13:03 run today in the 88th running of the Pikes Peak Hill Climb, just as the snow flurries at the summit and the rain on the rest of the mountain began. 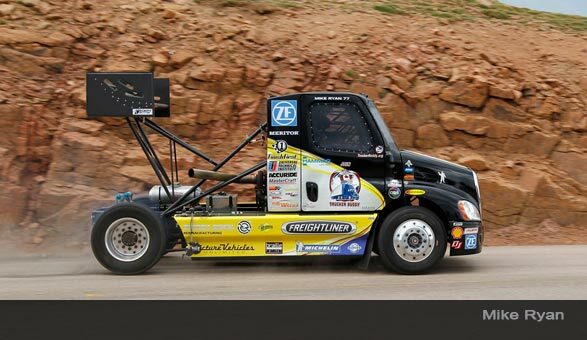 Our Detroit Diesel Powered Freightliner Cascadia ran well, in spite of suspension understeer issues that slowed us in the switchbacks and took away what otherwise might have been a record run. We were 20 seconds off of our still standing 2006 record of 12:43, and all things considered, I think that we had an awesome day. To do a run like this with an engine that was built “In-House” in two months time, by Detroit Diesel Engineers and technicians VS the very well developed Mercedes Super Truck Factory Race Team engine that powered our previous Century Class Truck for 8 years is a testament to their skills. Add to the fact that the new truck is 1200 pounds heaver and the performance today becomes more impressive. Thanks to all of you that have been involved, for the very terrific and amazing day that we had today. I am very fortunate because of it.